Seacombe Lodge, King’s Road, Clapham (a district of London south of the River Thames), was part of the Clapham Park development of upscale villas and gardens planned by the master builder Thomas Cubitt who also built his own mansion, named Lincoln House, in the area. Pictures of Seacombe Lodge have not been found – but some photographs of the neighbourhood are available. 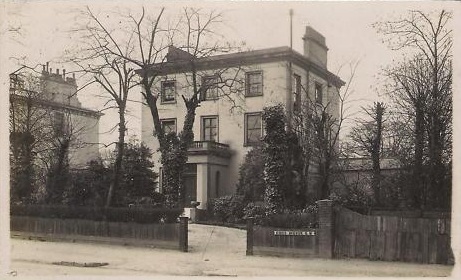 A house named Belvedere on King’s Road (renamed to King’s Avenue), Clapham Park, pictured on a post card dated 1909, in the neighbourhood of Seacombe Lodge. A succession of occupants moved in and out of Seacombe Lodge. In the 1850s it was the family home of Barnard Marks, a ‘shipping merchant’, his wife Ann and their young children. By the 1861 census the Marks family had moved north of the River Thames to Kensington (1). In March 1862 Thomas Gooch of Seacombe Lodge, Clapham Park was elected a member of the Society of Arts (the Royal Society for the encouragement of Arts, Manufactures and Commerce) (2). A Clapham Directory for 1866 listed Edward Whistler as the owner of Seacombe Lodge. 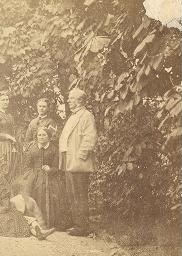 His neighbours were William Kerr of Langlands and James Youl of Waratah House; while Richard Johnson lived at Belvedere House, pictured above (3). 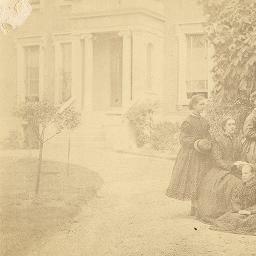 Photograph of the family of James Youl at Waratah House, Clapham Park. Online collections of the Archives Office of Tasmania, Australia. E Whistler begs to call the attention of noblemen and gentlemen to his large and well-selected stock of the above; also, watches, chains, and diamond ornaments, second hand. A descriptive catalogue forwarded on application. E Whistler, 11 Strand, London. Edward Whistler died in 1873 at the age of 52. Gravestone at Brompton Cemetery, London. 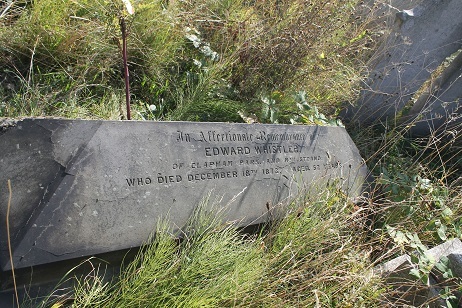 who died December 18th 1873, aged 52 years. Tuesday next - Clapham Park, a convenient distance from Clapham Road station. An excellent Leasehold Family Residence (built by the late Mr. Cubitt), with stabling and grounds of an acre and a half, occupying one of the best positions in the park, and in first rate order throughout. With possession. By order of the Executors of Edward Whistler, Esq., deceased. Messrs. Debenham, Tewson and Farmer will sell, at the Mart, on Tuesday next, February 24, at 2, the capital, detached residence known as Seacombe Lodge on the east side of King’s Road, Clapham Park, approached by a carriage drive, and containing seven bedrooms, a dressing room, a bath room, entrance porch and hall, drawing room about 23 feet by 15 feet, dining room about 23 feet by 16 feet, library, smoking room, large kitchen, and ample domestic offices. The stabling consists of three stalls, double coach house, and harness room, with loft and man’s room over. A considerable sum of money has been expended on the grounds, which contain a choice collection of shrubs and trees; in the rear of the residence is a handsome lawn, likewise an extensive fruit and vegetable garden, in which are a tool house, poultry house, piggery etc. There is also a lawn in front of the house. Sale on Tuesday next - Clapham Park, about a mile from Clapham Road Station - Excellent Furniture, Oil Paintings, Dresden and other china ornaments, bronzes, and general effects. Messrs. Debenham, Tewson and Farmer (in conjunction with Messrs. J. McLachlan and Son) will sell, on the premises, Seacombe Lodge, King’s Road, Clapham Park, on Tuesday next, Sept. 21, at 11 for 12, the superior furniture and general effects, comprising brass, tubular, and japanned iron bedsteads, bedding, mahogany chests of drawers, toilet and washing tables and glasses, an elegant satinwood drawing room suite in silk rep, handsome satinwood cabinet, oil paintings, bronzes, old china, set of oak extending dining tables, oak sideboard and dinner waggon, 14 chairs upholstered in morocco, oak bookcase, hall furniture, chimney and console glasses, curtains, carpets, hearthrugs, fenders, fire-irons, culinary requisites, and other items. May be viewed on Monday next Sept. 20, and catalogues obtained on the premises; of Messrs. J. McLachlan and Son, Clapham Common; and of Messrs. Debenham, Tewson and Farmer, 80 Cheapside. Sept. 30, at Seacombe Lodge, King's Road, Clapham Park, Mary, wife of Thomas M. Rickman, F.S.A., and daughter of the late George Lynam, Esq., of Stoke-upon-Trent, aged 55 years. By order of the Executrix ~ Clapham Park ~ The valuable contents of the residence, including grand pianoforte by Erard, 300 volumes of books, oil paintings, water-colour drawings, and miscellaneous effects. Messrs. Ventom, Bull, and Cooper will sell by auction, on the premises, Seacombe House, King's Road, Clapham Park, on Friday, March 21, at twelve precisely, the well-made household furniture, comprising the appointments of eight bed-rooms including brass and iron French bedsteads and bedding, walnut and mahogany suites, with winged wardrobes and duchesse dressing-tables, mahogany dining-room furniture, extending dining-tables, sideboards, drawing-room suite upholstered in crimson satin damask, occasional and other tables, whatnots, console tables and glasses, library furniture, including mahogany bookcase, cottage pianoforte by Cramer, harmonium, Turkey, Axminster, and other carpets, clocks, ornaments, linen, china and glass, plated items and kitchen requisites. May be viewed the day preceding and morning of sale. Catalogues may be had on the premises, and of the auctioneers, 35 Old Jewry, E.C. In 1895 the vacant house was taken over by some shady characters involved in a strange kidnapping and extortion plot. The alleged victim, Mrs Winifred Gordon, claimed that she was lured to Seacombe Lodge on the pretence that a billiard table was for sale. After being robbed of jewellery and securities she was kept captive in the house for three days to give time for the villains to cash the securities. A number of men were brought to trial and the case was reported in the newspapers over a number of months (6). wages £36; small family; three maids kept. Apply letter, Mrs James, 131 King's Avenue, Clapham Park. This was a way of life that was not to last. After the Second World War the King's Avenue mansions were demolished for redevelopment of the area as part of a programme for new social housing for London. General Sources ~ Notices from The Times were accessed at The Times Digital Archive online. Reports from the London newspapers Daily News and The Standard were found at the 19th Century British Library Newspapers online. (1) A birth notice in the London Daily News, 9 August 1855, stated: ‘August 7, at Seacombe Lodge, King’s-road, Clapham-park, the wife of Mr Barnard Marks, of a daughter’. The London address of the Marks family in 1861 was Stanley Gardens, Kensington (1861 census reference: RG9/13, folio 90, p. 25). Barnard Marks was identified as a shipping merchant in the 1871 census when the family was now living at Alexandra Rd, Hampstead (1871 census reference: RG10/197, folio 18, p. 30). (2) Journal of the Society of Arts, Vol. 10, 1862, p. 276 (Google eBook). (3) The 1866 Clapham Directory is printed in Clapham Park & Balham 1872, Old Ordnance Survey Maps, London Sheet 125, published 1996 by Alan Godfrey Maps. (4) The Post Office London Directory 1852 was accessed at the website: Historical Directories . The 1867 notice was from the The Owl, A Wednesday Journal of Politics and Society, London, 10 July 1867, page 8 (Google books online). (5) In 1859 Thomas Miller Rickman and Mary Lynam were married at Stoke upon Trent (website FreeBMD). The father of Thomas Miller Rickman was the architectural historian Thomas Rickman who was a master of the Gothic Revival style (webpage: Biography of Thomas Rickman ). In the 1891 census Thomas Miller Rickman, surveyor and architect and now a widower, was living at 8 Montague St, by the British Museum (1891 census reference: RG12/209, folio 38, p. 28). (7) The London Gazette (online archive), dated 18 July 1930, reported a land registry record for Thomas Henry James of Seacombe, 131 Kings Avenue, Clapham Park, London SW4.